Stewart-McKoy, M. (2013). “Beautifying the Beast”: Customising online instruction in a writing course for Jamaican tertiary-level students. Studies in Self-Access Learning Journal, 4(3), 157-174. 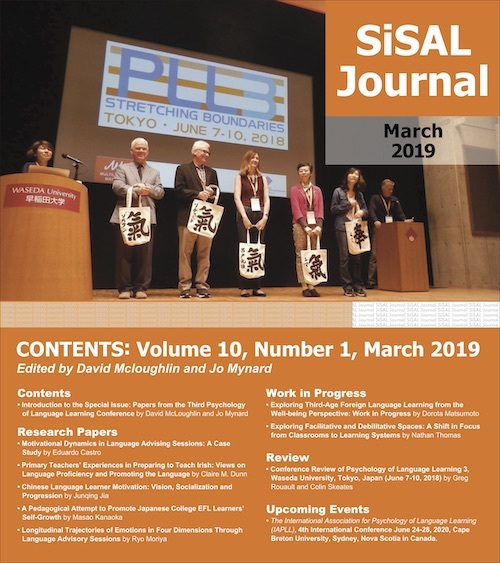 This paper describes an on-going project which uses a design-based research approach in the design and development of customised online instruction for Jamaican tertiary-level students pursuing academic writing courses. The customisation of the academic writing content for online consumption is meant to spark student interest, prolong their online engagement and facilitate self-directed learning. This manuscript provides an overview of the four phases and describes in detail the processes and procedures involved in the completion of phases one and two of the research and the plans for implementation and evaluation of phases three and four. The institution in which this research was conducted is a Jamaican, government-owned higher education institution which offers technical and professional level education and training for candidates in Jamaica and the wider Caribbean. The students who are accepted are speakers of English (largely from the Caribbean) and are matriculated to the university with a minimum of four passes (English and Mathematics are compulsory matriculation subjects) in the Caribbean Examinations Council (CXC) examinations or its equivalent. The unit in which the research was conducted provides academic writing modules and facilitators for the all members of the institution’s student population. The academic writing courses offered by the research unit are compulsory, general education courses which focus on exposition, comprehension, critical thinking, argumentation and critical reviewing. These academic writing courses are traditionally offered as face-to-face courses with some lecturers using online complements to facilitate their students. In recent years, there have been changes to the demography of students entering tertiary-level institutions (Stewart-McKoy, in press) as well as the Information and Communication Technologies (ICT) boom and the potential of online, distance learning and e-learning opportunities. Given these rapid changes and the potential for improving students’ learning with ICT, the unit which services the institution with these modules was recently mandated to provide, in addition to the face-to-face courses, online versions of academic writing courses beginning with the 2013/14 academic year. Research in the field of academic writing has revealed that for decades, tertiary-level students have struggled with writing courses and their poor writing performance and skills have plagued lecturers and professors internationally (Baden, 1974; Ramsay, 2011; Souriyavongsa, Rany, Abidin, & Mei, 2013). In Jamaica, lecturers at tertiary-level institutions are confronted with similar challenges as their international counterparts. Virtue (2013) highlights the abysmal communication and abominable language skills of Jamaican tertiary students with many of them repeatedly registering for, pursuing and failing these communication modules during their university lifespan. Similarly, Hamilton (2010) highlights that forty per cent (40%) of tertiary level students fail English-based communication courses, with the majority of the remaining sixty per cent (60%) struggling to achieve passing grades. 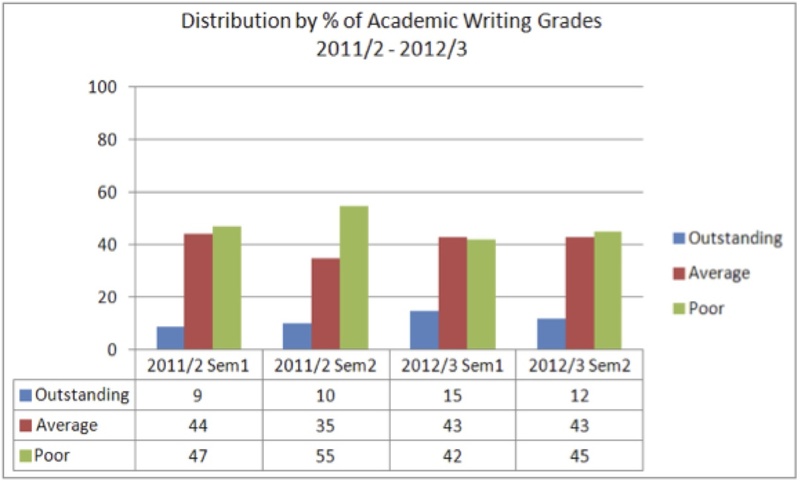 At the research site, the distribution of students’ academic writing grades for the last four semesters (academic year 2011/12 – semesters 1 and 2 and academic year 2012/13 – semesters 1 and 2) corroborate the reports of Virtue and Hamilton (Figure 1). Please note that the research site has a pass mark of 50% with a letter equivalent of C. For the purposes of this paper, the student performance has been divided into three categories: outstanding (ranging from B to A), average (C- to B-) and poor (F to C-). In addition to the writing challenges that Jamaican tertiary-level students face, they are less than au fait in the online classroom. Stewart-McKoy (in press), in her research which aimed to generate Jamaican tertiary students’ digital profiles in order to design and develop relevant virtual learning environments, found that more than sixty per cent (60%) of the research participants were not very comfortable creating online content nor engaging in academic searches which took them beyond Wikipedia and Google. 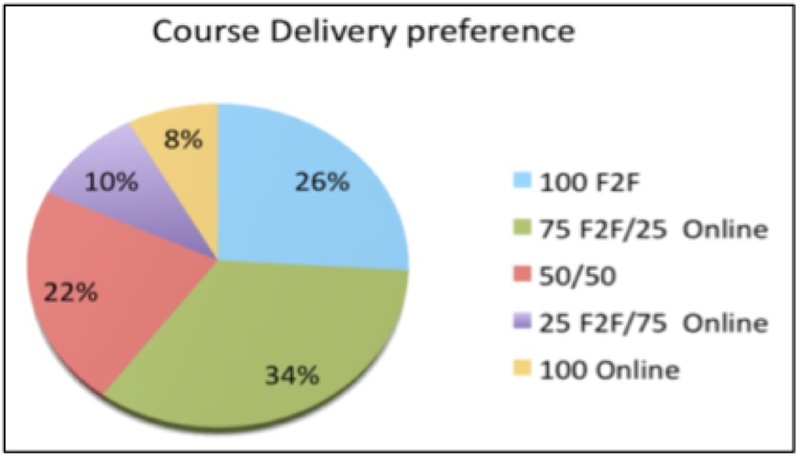 A combined sum of sixty percent (60%) of the respondents preferred face-to-face course delivery to online instruction (Figure 2) and more than seventy per cent (70%) of respondents showed a high affinity for teacher directed instruction (lectures: 73% and teacher-led tutorials: 71%). Hunte’s (2010) research parallels Stewart-McKoy’s in which she surmised that the online Caribbean learners of her study were really traditional, time-bound and place-bound students who lack the requisite digital skills to function effectively in the online learning environment, the facility to engage in autonomous learning activities and to be responsible for their own learning. The tertiary-level students of this research are then faced with three predicaments – that of having to pursue the module based on its obligatory characteristics in order to fulfil graduation requirements; that of pursuing the notorious academic writing courses; and that of doing the module completely online. How then does one “beautify the beast”? Considering that the academic writing modules are already feared by students and that these modules are now perched for online delivery, how does one customise said modules to spark students’ interest and ensure their continued engagement? The specific purpose of the research was to customise an online academic writing module to address Jamaican tertiary-level students’ writing challenges and their difficulties in online learning environments. The customised learning environment aimed to spark students’ interest in the online writing module, ensuring their on-going participation in the online course and encouraging learner autonomy and self-direction. The design, development and implementation of a customised online course at this research setting is a modified extension of the researcher’s doctoral study at the University of the West Indies, Mona campus, which focuses on the design, development and implementation of e-learning enhanced environments based on students’ e-learning profiles. This research was conducted in the 2012/13 academic year during the period when the research intuition’s faculties and departments were mandated to provide online models of traditional face-to-face modules. The investigation sought to design and develop a custom-built online academic writing module for Jamaican tertiary-level students using a design research methodology. Design-based research (DBR) which emphasises technological interventions, is predominantly rooted in pragmatism and is naturalistic, participatory, contextual, integrative and involves iterative processes in which there are continuous cycles of planning, action and reflection. DBR seeks to improve educational practices through technological innovations and with researchers and practitioners collaborating in real world contexts (Brown, 1992; The Design-Based Research Collective, 2003; Reeves, 2006). Figure 3 provides a graphical representation of the phases of design-based research. It is the prominence of designing and developing customised online writing instruction for Jamaican tertiary-level students based on their profiles and learning needs that led to the selection and application of the design-based research methodology in this research project. How can an academic writing online module be customised to spark students’ interest, ensure their active participation and encourage self-directed learning? What are the learning characteristics and needs of students pursuing academic writing courses? What components are deemed relevant to spark students’ interest, ensure active participation and encourage self-direction in an online academic writing module? Review of relevant literature. Phase 1 of the project included extensive examination of e-learning software, journal articles, academic theses and books which highlight e-learning, pedagogy and usability principles in online learning platforms. Research participants. Purposive sampling was used to select the two content writing experts, one multimedia specialist, six (6) academic writing lecturers and fifty-four (54) academic writing students of the 2012/13 academic year who collaborated in providing essential data (via questionnaires and interviews) regarding students’ characteristics and learning needs. This data collection process was intended to facilitate the construction of custom-made online instruction in order to address students’ writing challenges and their difficulties engaging in online environments. Research instruments. The data was collected from the research participants using an online student questionnaire, which was administered once, and individual teacher interviews. 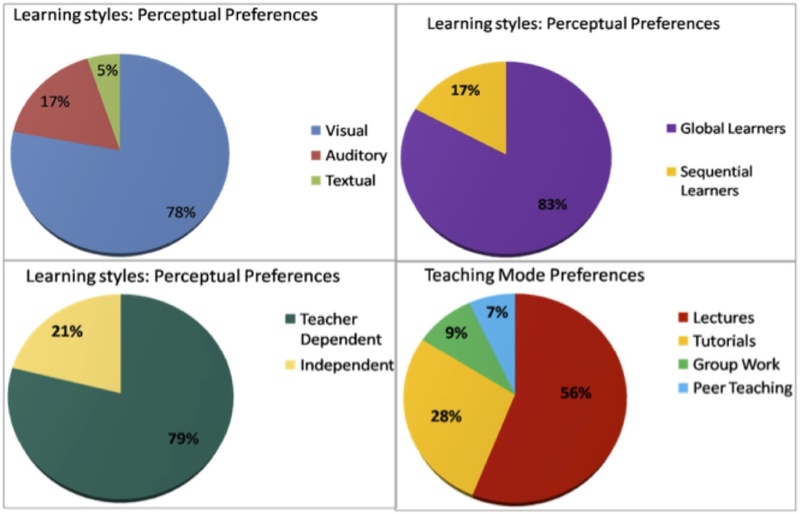 The student questionnaire was administered online via Survey Monkey and comprised two main sections with sixteen items which examined students’ learning styles and preferences, their teaching delivery preference, their academic writing needs and their expectations. Students were informed via email of the research purpose and were asked to assist in the process of customizing online writing instruction by completing the questionnaire. The email also included the link to the research survey. The teacher interviews had five open-ended questions which sought to get a deeper understanding of students’ engagement with the writing modules, students’ characteristics and learning needs from the teacher’s perspective. Ethical issues. In research that involves researcher/participant engagements and which includes divulging personal information in order to gather data, the well-being of the research participants must take precedence. Silverman and Marvasti (2008), Babbie (2007), Creswell (2012) and Denscombe (2007), among others, remind researchers that while carrying out their investigations, the research ethics (permissions obtained, research purpose communicated, consent sought, confidentiality maintained and identities preserved) must be observed. Permission to conduct the survey among students was sought from and granted by the head of the unit responsible for the academic writing modules. The students pursuing the academic writing courses were informed electronically about the research and its purpose. They were also informed that by completing the online questionnaire, they were agreeing to participate in the research and were assenting to the publication of the findings. Additionally, they were advised that their participation was voluntary, that anonymity would be guaranteed and that they could withdraw from the process at any time. Similar information (research purpose, voluntary participation, assurance of anonymity) was communicated to the six lecturers who participated in the interview sessions. 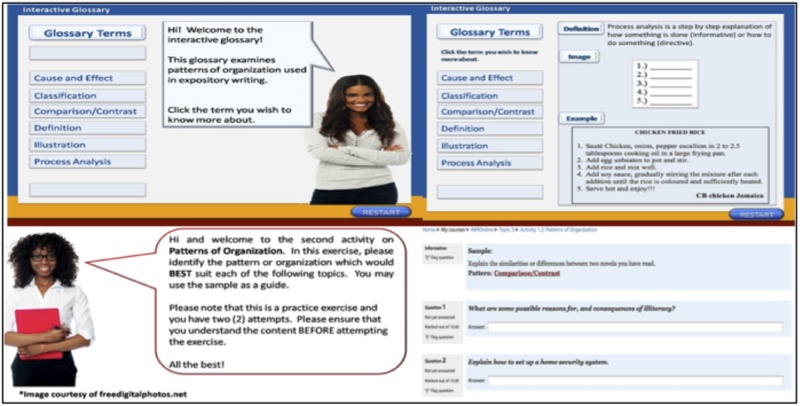 Phase two of the project involved the generation of academic writing students’ characteristics and their academic writing learning needs in order to create customised online instruction which would stimulate students’ interest in the writing course, ensure their prolonged engagement with the content and facilitate their self-directed learning skills. The data gathered from the students’ questionnaire and the teachers’ interviews were coded and placed in categories/themes. The categories from both groups were examined and the implications were considered in order to customised instruction for students. Figure 4 highlights the main findings of the students’ questionnaire and Table 1 documents students’ characteristics and their implications for online content. After students’ characteristics and learning needs were mapped to the implications of online instruction and guided by the literature of design, e-learning and pedagogic principles, the key components relevant to spark students’ interest, ensure active participation and encourage self-direction in an online academic writing were documented for design and development purposes. A course development plan was then constructed and shared with the online project team. The development plan comprised a content writing guide and writing template. In the absence of a formal institutional document which speaks to the details of writing of module content for online delivery, a guide which provided content writing guidelines was created for use among the team. The writing guide addressed learning outcomes, content, activities, resources, assessment, content organization, language use and general reminders. Figure 5 is a screenshot of a section of the guide. The accompanying writing template was created to ensure consistency in content creation and to facilitate content writers in organising the module contents (See Figure 6). The course development plan also displayed a mockup layout of the virtual learning environment with placeholders for data, course content template breakdown for each unit and possible sources and software for multimedia enrichment. Figure 7 shows snapshots of the course layout and template details. The customised academic writing module was then developed to include following key components based on data gathered. The elements are discussed in the paragraphs which follow. A team of online assistants assuming the role of virtual onscreen coaches (also known as pedagogical agents) were built into the module in order to deliver the interactive tutorials and provide online support with the writing content. 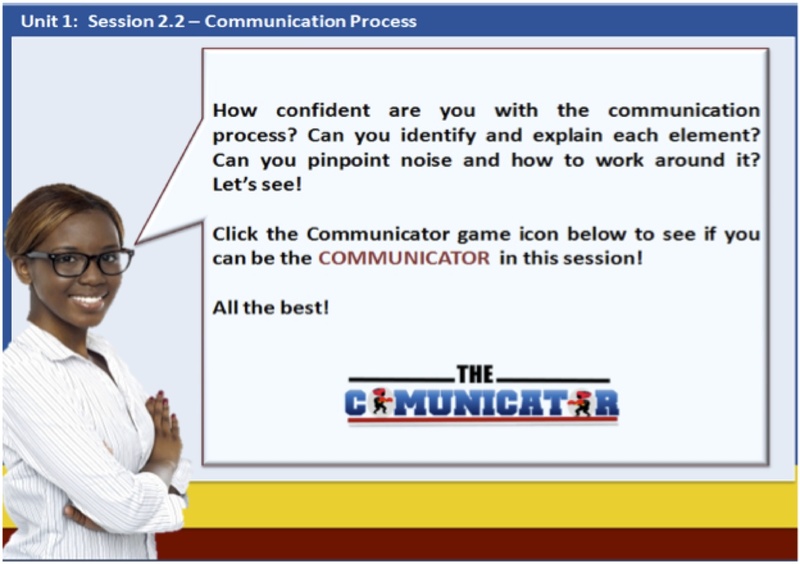 The virtual coaches use conversational tones in their engagements with the students (Clarke & Mayer, 2008). The pedagogical agents were also included in the customised module to reduce students’ dependence on the teacher as sole information provider. 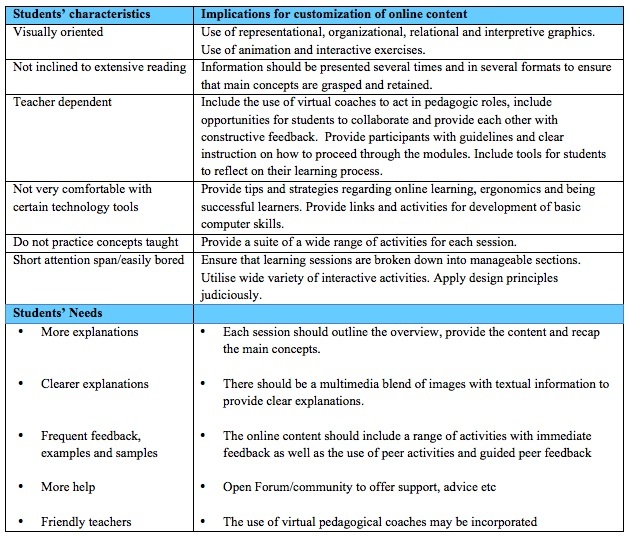 Figure 8 provides screenshots of the online pedagogical agents used in the course. Interactive learning tutorials and activities which reflect the e-learning principles of Clarke and Mayer (2008) and Gagné’s nine events of instruction (Gagné, Briggs & Wager, 1992) were included in the customised environment to address students’ boredom and short attention span. 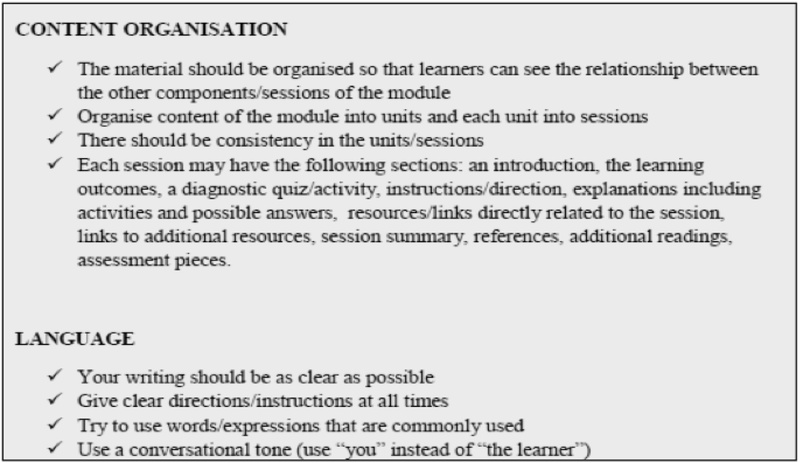 Additionally, in order to avoid information overload and to prolong students’ time on tasks, the module units were broken down into manageable sessions (See Figure 9 for screenshots of interactive activities. An online learning contract, presentations on participants’ responsibilities (overall and for each unit) and the inclusion of guided reflective journaling practices at the end of each unit were included to initiate and encourage self-directed learning and metacognition. Figure 10 shows the reflective task for one of the units and Figure 11 displays screens shots from the participants’ responsibilities presentation. 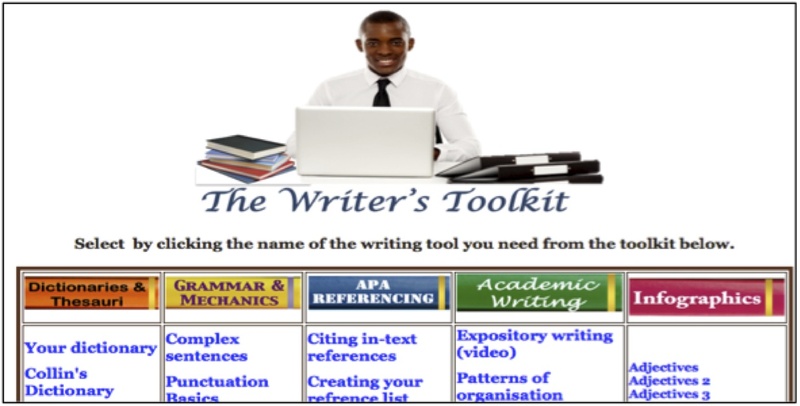 A Writer’s Toolkit was included to provide students with additional resources and assistance. The resources in the Writer’s Toolkit were two-tiered with both content specific resources and general language and communication information. The Writers’ Voices forum was also implemented to provide an online community space in which students could collaborate, seek advice and provide collegial support. Figure 12 provides a snapshot of the Writer’s Toolkit. In order to address students’ concerns regarding computer-based proficiency, links and interactive computer-based tasks and activities were included in the online learning environment. The activities and tutorials also provided clear instructions on how to proceed throughout the online tasks. Figure 13 provides a snapshot of how students are facilitated. A suite of activities (quizzes, games, forum, questionnaires etc.) found within the units and within the Writer’s Toolkit were included in order to address the concern of students’ not practising enough. Figure 14 is a section of an activity (game) within a tutorial session. A maximum of three font types were used in activities and learning content. Georgia, Arial and Hobo fonts were used consistently throughout the online content. Font size 14pt was used to facilitate reading the learning content online. Critical information was easily recognisable by the use of bold formatting. Although a site map was provided as well as guidelines regarding sequential use of the content, students could control their learning pace by selecting sessions and activities based on their needs. The interactive lessons file size was reduced in order to facilitate smooth downloading for those who wished to engage with the interactive content away from the online environment. Navigational text was used instead of icons in order to facilitate those with minimum computer skill sets. Information icons (exclamation and question marks) were also used within the sessions. Additionally, the use of graphics, animations and interactive exercises were included to spark interest and to satisfy visually oriented students. The tailor-made prototype was uploaded to the sandbox of the research site’s virtual learning environment. It will undergo a series of examinations before being migrated to the live virtual learning environment at the start of the 2013/14 academic year for students’ consumption. The academic writing online courses are expected to be offered in the 2013/14 academic year and will constitute the pilot phase of the online project. This will be phase three of the project in which the online module will be implemented, students will be monitored and their experiences, challenges and successes documented in order to effect modifications to the module. Phase three is expected to include two iterative cycles with the first cycle taking place the first semester of the 2013/14 academic year and the second iteration following in the second semester of the academic year. In order to record the information of the iterative cycles, data will be collected using the virtual learning environments reporting system, teacher logs, students’ journals, samples of students’ work and information gleaned from the use of online questionnaires. The analysed data from the first iteration will inform the modifications to be made before the second iteration commences. The findings of both iterations will inform the final stage of the project. Phase four of the project is expected to take place at the end of the second semester of the 2013/14 academic year. The data collected from the second iteration will guide the analysis and documentation of a set of guidelines which may be used by other faculty members interested in creating online customised instructional content for their students. 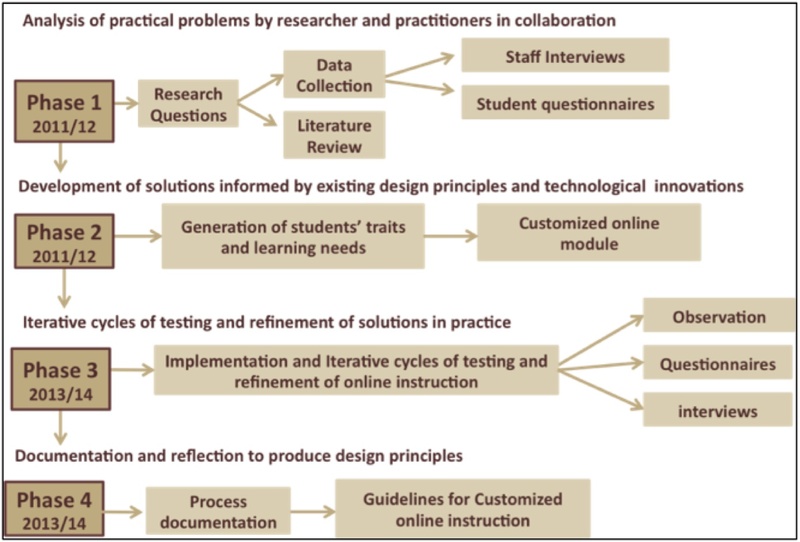 Figure 15 provides a graphical representation of the four phases of the design-based research project in which online writing instruction was customised. This paper described the design and development of a customized online writing instruction using design-based research. Two of the phases were completed in the 2012/13 academic year with the other two to be implemented in semesters one and two of the 2013/14 academic year. The process and principles of all four stages of the research project have been documented in this manuscript and it is hoped that the analysis of the data collected in phases three and four will aid in the construction of a set of guidelines or a toolkit beneficial to other faculty members interested in designing, developing, implementing and evaluating customized instruction for their students. Michelle Stewart-McKoy is a lecturer in the School of Humanities and Social Sciences at the University of Technology, Jamaica. She is also a doctoral candidate at the University of the West Indies, Mona campus where her dissertation focuses on the development of e-learning enhanced environments based on learner profiles. Her research interests include student-centred e-learning, virtual learning environments and game-based learning. Babbie, E. (2007). The practice of social research. Belmont, CA: Cengage Learning. Creswell, J. (2012). Educational research: Planning, conducting and evaluating quantitative and qualitative research. Boston, MA: Pearson. Denscombe, M. (2007). The good research guide for small-scale social research projects. Buckingham, UK: Open University Press. Gagné, R., Briggs, L., & Wager, W. (1992). Principles of instructional design. Fort Worth, TX: Harcourt Brace Jovanovich College Publishers. Ramsay, P. (2011). Much writing begets good writing: Some considerations for teaching writing in an Anglophone creole context. Caribbean Curriculum, 18, 27–42. Reeves, T. (2006). Design research from a technology perspective. In J. van den Akker, K. Gravemeijer, S. McKenney & N. Nieveen (Eds. ), Educational design research (pp. 52-66). London, UK: Routledge. Stewart-McKoy, M. (in press). Digitize me: Generating e-learning profiles for media and communication students in a Jamaican tertiary-level institution. Journal of Educators Online.